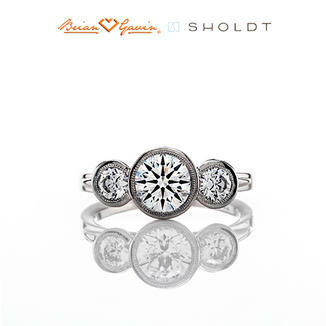 Three stone bezel engagement ring pictured with 2 diamond melee (approx. 0.50 ctw) sidestones. Ring can be made for any shape and/or size center stone. Any finish (bright, brushed, sandblast, "German finish", etc.) can be applied to any ring. Price is for setting only for diamonds up to 2 carats. Add $100 for diamonds larger than 2 carats. Select your diamond from our extensive online diamond inventory. Brian Gavin brings you Sholdt's Remarkable Engagement Rings, Wedding Bands and Men's Bands built byhand in Seattle since 1935. When inspired design meets incomparable craftsmanship the result is memorable. Our rings, designed to be unique works of art, are custom made to order. Master jewelers create each piece by hand, using perfected methods and exacting standards. Each ring is better than perfect. It's art.